3 sizes to choose from. Create on-site with any standard inkjet or laser printer. Snaps together for a custom, personalized, and professional look. Available with magnetic or pin fasteners. Pre-printed logo optional but not required. Lightning fast turnaround. FREE SHIPPING. Please also see our rectangle versions. Pin, Swivel Clip, Strap Clip, Military Clutch, and Adhesive. Production time is just 1 day. 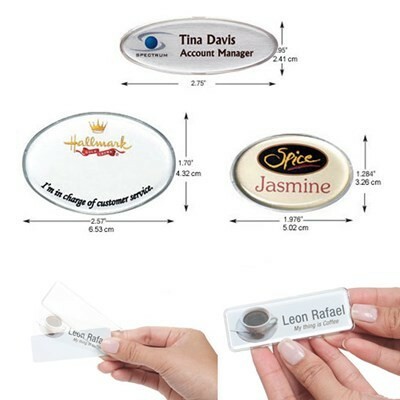 If adding a pre-printed logo (optional), please expect 1 - 5 days production. Same day and next day rush available.